This story, like so many of my misadventures, starts with my beloved husband Dale (whom, I might add, wholeheartedly supports my columns about him). Some background: Dale has had his share of driving mishaps. Last year, for instance, he ran over his sister’s goat. Thankfully, we see everything with a sense of humor in our family – even the death of a sweet goat. Dale paid his sister so she could buy a new goat, and he also earned a new nickname: Goat Killer. It’s become a long-running joke – one of our great friends even customized her ringtone for Dale to sound like a bleating goat. Goat Killer and I had plans to go fishin’ this past week. Special driving chops were required, though: we were hauling our new (used) pontoon boat behind us. Now, maybe we should have seen the signs before – our secondhand pontoon boat was tricky from the start. We paid $500 for the boat, then $450 to get a working motor, and then another $500 for a trolling motor – which arrived without a propeller missing from the box. But, after a summer of hard work, we finally got our baby together and we wanted to test her out. We loaded up our redneck boatin’ supplies and picked up our friends Crimson (Roll Tide!) and Joey for a day of fishin’. Dale was our driver. Everything seemed fine until we hit a stoplight and had to take a sharp left turn. Dale was driving a cool 10 miles per hour, but he turned too hard. 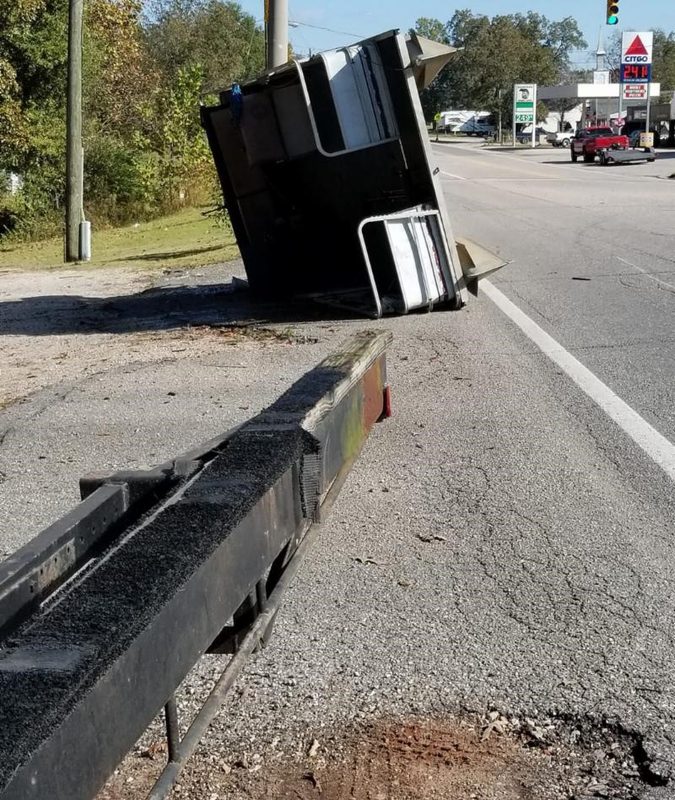 The pontoon boat came completely off the trailer and landed on its side in the middle of the road. Everything fell out – coolers, drinks, ice, fishing poles, gas tanks, and batteries. We had to call the police to block traffic and run all over the side of the road picking stuff up. And this wasn’t just any traffic – this was game day traffic, Bama vs. Mississippi State. The cops made sure we were well aware of the urgency of the situation. “Y’all got to get this mess cleaned up! Gameday traffic, gameday traffic,” they kept telling us. While one cop directed traffic on one side of the road, I helped direct drivers on the other. Meanwhile, I was screaming at people, “Don’t smoke near the boat! Don’t smoke near the boat!” as $30’s worth of gas had gushed all over the road. Several Good Samaritans stopped to help, and since the snacks were out already, I went ahead and snagged myself some sweet tea and a bag of popcorn. Our team of helpers couldn’t get it to budge, so we had to have the pontoon towed. But we weren’t going home – we told the towing company to take us to the water. We were going fishin’! There was no major damage to our boat, and no one was injured. We didn’t catch a single bite, but we still had a great time. After a few hours on the water, I gave my husband a break. “We’re not letting you do any more damage today, I’m taking over,” I told him, and I drove the pontoon right onto the trailer. Now, Dale’s got a new nickname: Flip. He’s also earned a new ringtone: On the Pontoon. 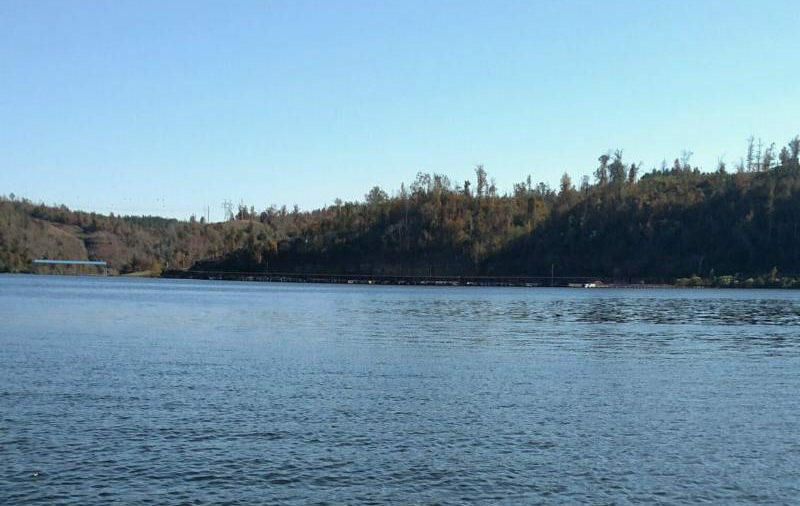 All’s well that ends well, friends – especially if you end up on a pontoon boat! The view from our pontoon once we made it to the water!